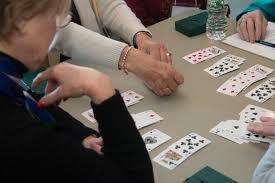 Duplicate Bridge - We hold duplicate bridge games every Wednesday and Friday afternoons. The games begin at noon and run until play ends, usually between 3:00 and 4:00. Players need to have partnerships already formed, but we have rosters and sign-up sheets to facilitate.